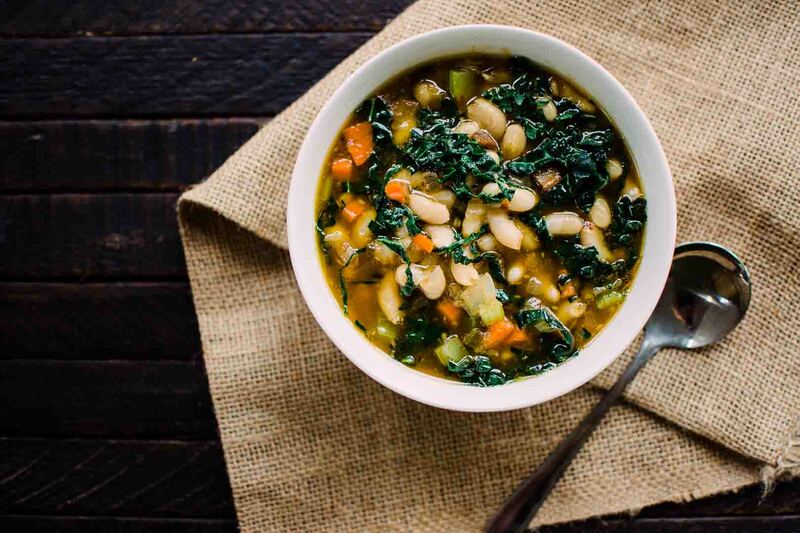 Kale and white bean soup, hearty and marvelously simple, makes it to our kitchen table a few times each winter when the damp, cold, dark days of the Pacific Northwest call for something both warming and filling. It’s an inexpensive soup to make, combining good broth with winter vegetables and beans. Making Kale and White Bean Soup is also an exercise in patience and in delayed gratification. It’s not a food of immediacy (though you can certainly use some purchased chicken bone broth and a jar of organic beans and have it done in twenty minutes), and, instead, it takes a bit of advanced planning: preparing a long-simmered bone broth, soaking beans and boiling them until tender before assembling it all in the soup pot. Bone Broth gives this soup richness. A real broth adds not only flavor as the base of soups and stews, but it also provides much needed nourishment, too. Bone broth’s savory flavor enhances and gives depth to otherwise bland foods like beans. Those savory notes which aren’t quite salty and are certainly not sweet, are more accurately described as umami – a Japanese term – and they’re the result of the long-simmering time required in making good broth. As bones simmer slowly, they release amino acids, the most notable of which is glutamine – an amino acid that is particularly responsible for bone broth’s elusively described but distinctly savory flavor. Bone broth is also particularly rich in gelatin, which is produced when the collagen-rich connective tissue that adheres to bones dissolves in water. Gelatin helps you to get more protein out of the foods you eat, making bone broth a perfect partner for beans. 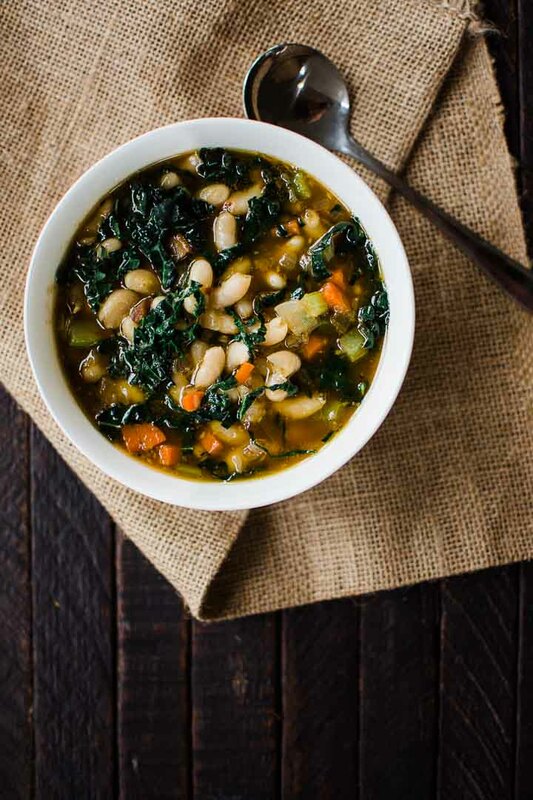 Cannellini beans give this soup body. 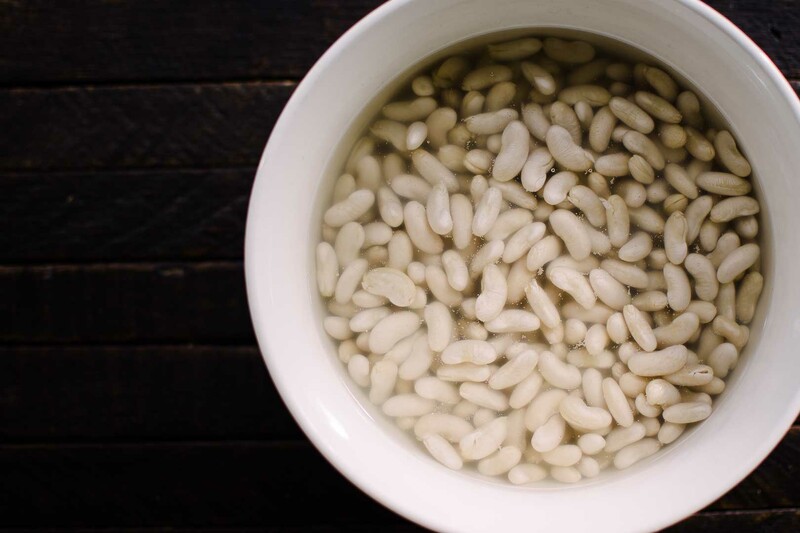 Cannellini beans, a small, kidney-shaped white bean, gives this soup its body. Cannellini beans, like all beans, are rich in folate – a B vitamin that is critical for women of reproductive age. They are also particularly rich in fiber, which not only helps to keep you feeling full longer, but also helps to nourish and feed the microflora of the human gut. Fiber is food for good bacteria, and eating fiber-rich foods correlates with more diverse, and better overall gut health. Kale gives this soup brightness. Lacinato kale, added just to the end, gives this soup its brightness. Kale is particularly rich in beta carotene, an antioxidant that can be converted to vitamin A in the right circumstances, as well as vitamin K1, a nutrient that helps your body respond to injuries and helps your blood to clot efficiently. Perfumed by sweet bay, Kale and White Bean Soup is a staple on my family's kitchen table during the cold, dark evenings of winter when dinnertime calls for something wholesome, nourishing and filling. It's easy to make, wonderfully light on the budget and excellent served with a hunk of whole-grain sourdough bread and a drizzle of olive oil. Toss the beans into a large mixing bowl, and cover them with hot water by 2 inches. Stir in the baking soda, and allow the beans to soak at least 12 and up to 24 hours. Drain the beans and rinse them well. Toss the beans into a pot, cover them with water by 2 inches and then stir in the salt. Bring the beans to a boil over high heat, and then turn own the heat to medium. Simmer the beans until tender and yielding, about 90 minutes. Drain the beans and set them in a waiting bowl, and then wipe out your soup pot. Warm the olive oil over medium heat, and then stir in the chopped bacon, allowing it to cook until it renders its fat and crisps, 6 to 8 minutes. Stir in the crushed red pepper, onion, carrots, celery and garlic, and stir them into the hot fat until they release their fragrance - about 5 minutes. Pour in the broth and the cooked beans, and then drop in the bay leaves. Cover the pot and simmer until the vegetables are cooked through, about 20 minutes. Uncover the pot, turn off the heat, adjust seasoning with salt, and drop in the chopped kale. Cover the pot once more and allow the kale to wilt in the residual heat of the broth, about 5 minutes further. You can use canned beans. You can use canned cannellini beans. I recommend these beans because they're organic and packed in glass jars. You can make the beans in advance.If you have extra time on the weekend, but not much during the week, just boil the beans in salted water in advance, and store them in the fridge up to five days or in the freezer up to 6 months. You can add them to the soup pot still frozen, if you're in a pinch. Made by simmering bones in water made slightly acidic with vinegar or wine, bone broth is relatively easy to make. It is also nutritious owing to its high protein content and relatively inexpensive. You can make bone broth easily (there’s great recipes in the cookbook Broth and Stock). I make a vegan version of this soup; in my house it’s called “it’s Tuesday and the CSA pickup is tomorrow and I’ve got all these veggies to use up to make room for the new stuff” soup. I can’t imagine life without kale. Well, I can’t, but it’s not nearly so nice. Debbies last blog post..got some time to waste? That is, “I CAN, but it’s not nearly so nice.” Good thing I don’t type for a living. Oh wait, I do. I usually don’t drain my soaked beans since I use spring water to soak them. Is this a problem? And does anyone know why beans would stay hard after soaking and cooking? Is there a connection with not draining the soaked beans? Beans can stay hard after cooking if you have hard water. I am new to this site and cooking, so I don’t know if this idea is frowned upon or not, but adding a bit of baking soda to the water helps. Also have heard not to add anything acid to the water until the beans are cooked as it can lengthen cooking. My understanding is discard the soaking water and rinse the beans. This washes away the anti-nutrients that have been broken down from the beans and reduced the glassiness that beans can produce. Old beans can take longer to cook as well. This soup sounds fabulous and healthy to boot. Thank you for sharing your recipe! This is agreat recipe, can I substitute kale with spinach.. maybe the goodness wont be the same.. any inputs..My four year old daughter will eat a bit of spinach but not kale.. This recipe sounds great. I don’t have kale (we try to grow our own) but I do have Okinawa Spinach, Brazilian Spinach and Ceylon Spinach along with Aibeka and other assorted green leafy vegetables. Can’t wait to try variations. Thanks for posting this inspiration. How funny- I made up a soup quite similar to this! I add leftover grass-fed ground beef (browned from the night before with onions/garlic) and some diced tomatoes (organic in a BPA free can will work in a pinch) and some gluten-free rice penne pasta (about a handful). It’s like pasta fagioli. Yum! I just made this soup, but added a splash of apple cider vinegar at the end. Perfect. Am I understanding these steps correctly? It just seems like a lot of cooking with the beans. Yummy and nice hearty warming winter soup. I love all beans and bean soups but white beans are the cream here in our home. ANGIE: in Answer to your question above. you would soak the beans over night, and drain. Then pop them in the slow cooker with all of the other ingredients except the Kale that is save to the last part of the cooking . A great serving idea for this soup would be to add some milk, cream, butter, cheese, dairy kefiran, or I guess even powdered eggshell to go along with it. That way, the calcium in the garnish can form a precipitate with the oxalic acid during mastication or digestion (this process, I’ve read, is responsible for that ‘mealy’ texture you get when eating rhubarb pie with cream), and no longer be bioavailable to do real damage. I’m glad you don’t consider goitrogens and oxalate to be too terribly alarming as some of the healthiest foods out there contain one or the other (e.g. green tea for oxalate, broccoli for goitrogens). Anyway, I just got my slowcooker back from repair, and I am overpoweringly excited to get back in business. Soup is my bread and butter, and, breaking my metaphor, I don’t have anything to eat with my bread without soup. On a sidenote I figured I would complain about how a friend of mine told me that 5.50 for a gallon of raw milk from the farmer’s market is “expensive,” as I actually consider that to be dirt-cheap, given that a halfgallon of semi-UHT Organic Valley is around $5.00. I told him that he’ll pay for every penny he saved on “Dean’s” later on. What do you mean by “to do real damage”? I thought the “real damage” that oxalic acid does is that it makes calcium (in particular) non-bioavailable. Thus, if you add high-calcium foods, it will just prevent you from getting the calcium. Is that not the case? Also, from my readings kale is low in oxalic acid, unlike spinach, rhubarb, sesame seeds, lambs’ quarters, sorrel, parsley, etc. Do you have a reliable source of information that they are in fact high? Or were you referring to another ingredient here? Thanks! Kale is a staple in our garden and I make something very similar to this often. Love it with the white beans and bacon! A quick question…when I change the water when soaking the beans do I add more baking soda? Or do I only add baking soda initially? Thanks for your amazingly informative posts! I only add it once, in the beginning. Love Kale…but be sure to get organic or grow your own if you can. It is one of the worst offenders for pesticide residue. Gosh, this looks amazing. I am vegetarian thinking about going vegan and I would totally make this!! Cool. I made a similar soup once, but unthinkingly used purple kale from my garden. The entire soup was purple! Delicious and amusing for the younger crowd, but that’s just a little warning for those who don’t want to eat “Barney Soup” as it was dubbed. Isn’t 1 Tablespoon of whey, vinegar or lemon juice supposed to be added to the soaking water for each cup of beans that are being soaked? No. This does not apply to certain beans who, instead, benefit more from baking soda or another alkalizing ingredient. Is this something that would freeze well? I was making broth, again, to cook the beans in and the broth is now brown. I like my bean soups with pork, so I had a pork hock and tail which I used. What am I doing wrong? I looked at this recipe when it was emailed, and didn’t cook the beans in water, just the broth. Is this the problem? Did I over cook it? Is it still ok to eat? I don’t have any celery and since I can’t get organic celery locally I’m not running to town to pick some up. I think it will still be good, just not quite the same. I made this soup a month ago and have been craving it bad! 1. Do you drain then add the beans back into the pot then continue to melt the butter with the beans? Crisping the bacon and softening the onions was a little challenging with the beans still in the pot and took a long time. 2. Your directions mention adding garlic in but they are not in the ingredients list. Should there be garlic? I thought it tasted great without and probably would not add any. My husband and I just got back from our honeymoon trip to Tuscany and we have eaten similar delicious meals. The recipe outlines that you are using TWO SEPARATE stock pots: 1 to cook the beans, 1 to cook the onions/bacon etc. yes, but the last instruction involving beans was to drain them. they were never added to the actual soup which is in ‘a large stockpot’. so i can see how ashley misunderstood. Thanks, that helps to know. Though like some others I am wondering exactly when the fully cooked beans are added to the second pot of onions/bacon etc. Would that be when you first add the chicken stock to the pot, or when the second pot has finished it 20-30 minute simmer? This is the second recipe I have tried from this site. While I like the recipes I am often disappointed with the directions, which often omit steps or ingredients or both. I have been able to fill in the blanks, but someone with less cooking experience may not. Might be beneficial to re-edit the recipes more carefully. How much garlic is supposed to go into it? My family enjoyed this soup! Thank you so much. It was delicious! How can I print just the recipe, not the whole page? The garlic, IN OR OUT??? (In instructions, but not ingredient list). I think the recipe is missing a few things. How much garlic (not listed in the ingredients) and when do you add the beans back to the soup after cooking (not in the directions). Thanks, I can’t wait to make this, sounds so good! Great recipe! I made it vegetarian and used smoked paprika in place of bacon. Two issues with this recipe: there is no listin for a garlic quantity although it is included in the recipe instructions. Also, you never mention at which step the beans should be added to the rest of the soup. I used canned beans and added them in with the broth and it was delicious!!! We made this soup tonight and it was such a hearty meal after a long day in the garden. My kids loved it! I hope you don’t mind me pointing out that garlic is not listed with the ingredients, but is mentioned in the instructions. And there is no mention of when to add the beans. I just threw in a few diced cloves of garlic and added beans with everything else though and it turned out amazing. Thanks for sharing!! I adore this recipe ???? SO glad you like it. It’s a favorite for us, too. Looking at your white bean and kale recipe. Are the beans combined with the other ingredients before or after the final simmer. Okay, you need to post a budget friendly recipe once a week… This is something I can get excited about! Makes eating healthy doable! This is a delicious and beautiful soup. I didn’t plan ahead, so I used canned beans. I used one can of cannellini and one can of dark red kidney beans. With the dark green of the kale, my bowl was definitely a pleasure to look at and eat. My children enjoyed it, too. Thank you for a great recipe! This recipe looks absolutely lovely and I look forward to trying it. As a cook and fanatic about fresh ingredients, I am wondering if you have a source for high quality organic fresh dried beans? This looks perfectly delicious. I cannot wait to try a nightshade free bean soup! But, I haven’t been able to sub the red pepper flakes. Would you just omit or replace with a dash of lemon juice, or vinegar? Thank you for spending the time to include soaking and slow cooking tips. I just would omit them entirely, if you need it to be nightshade-free.